Hidden front slip pocket. - Back slip pocket. - Crafted from smooth leather. - Magnetic clasp fastening. Condition is Used but has no tear nor wear, this piece is in an exceptional condition! Add a sophisticated touch to office ensembles with this lovely leather tote. Made to get you through a busy working week, this handbag will make it easy to locate your essentials while on the go. Beautiful Radley bag in a supple, pink leather. Tie sides with decorative charm trim. Zip top closure. Slip pocket with logo embossed on back of bag. Second slip pocket inside back wall. Pink grosgrain lining with two zip pockets, Radley logo patch, slip pocket and phone pouch. Two inside pockets, one outside pocket. Light green lining. Pink storage bag. RADLEY Handbag, Chocolate Brown.. Condition is Used, with some marks (see photos). Original Radley dog tag included. Dispatched with Royal Mail 1st Class. Inside there are 2 open pockets and zipped pocket with the radley motive. There is a open pocket at the back - great for bus tickets etc. The bag is in a teal colour with spots. Corners are good as can be seen in the photos. Complete with a new dust bag, I have added a star key fob. It’s wonderfully roomy with an internal zipped pocket to keep little essentials in order. 14"x16" Approx Zipped Inside Pocket and Handles. Great, close to new condition, no flaws to report. 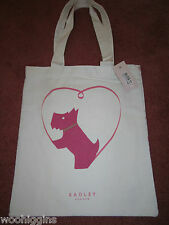 Lovely Radley green leather and cream canvas handbag with green leather Radley dog charm. Its size is 13"/33 cm wide x 7.5"/19 cm high x 5.5"/14 cm deep with 16" handles. It has a zipped opening and a lovely green patterned lining. Inside it has a side zipped compartment and 2 pockets. It has a Radley label and serial number inside. With Radley London dustbag. In very good condition. Genuine Leather Radley Handbag Medium. Burgundy Colour,Brand New Never Used. Genuine Leather Radley Handbag Medium. Burgundy Colour,Brand New Never Used.. Ideal work bag. Comes with dust bag. Dispatched with Royal Mail 1st Class. The bag has an open slip pockets outside, to the back of the bag. The top has a zip fastening, inside there are two open topped pockets and a zipped side pocket. Radley tote bag, grey handle and edge, black body, all leather. Radley handbag in cream and pale yellow leather. RADLEY GENUINE BROWN LEATHER HANDBAG. GOOD USED CONDITION UNFORTUNATELY WITH SOME MARKS INSIDE & SCRATCHES UNDERNITH ON THE LEATHER (LOWER PRICE) I MADE AS MUCH PHOTOS AS POSSIBLE SO PLEASE HAVE A LOOK. ANY QUESTIONS FEEL FREE TO ASK. PARCEL WILL BE SEND BY 2 CLASS SIGNED FOR. THANKS FOR LOOKING. RADLEY DARK GREEN LEATHER TOTE/ON SHOULDER BAG WITH DUST BAGVERY GOOD CONDITION. DARK GREEN LEATHER TOTE / ON SHOULDER BAG FROM RADLEY. 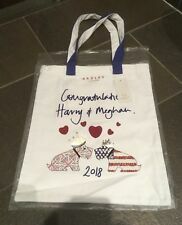 RADLEY ROYAL NAVY LEATHER TOTE BAG. Beautiful leather handbag by Radley Aprox. Measurements: 13"length across the middle 8 inches height (top to bottom) 3.5"on bottom Double handles carrier on top Pink textured fabric lining can be pulled out Two roomy internal zipper pockets and gadget pockets Slip pocket on back with card slot inside Quality foldable leather outer material Stamped on front ticket pocket Leather tag attached inside with embossed metal dog Original dog tag charm included is stamped on both sides Roomy classy handbag. Some small fluff pockets in the bottom, but nothing a good clean would sort! No smells, or animal hair present. Radley Home Sweet Home Picture Bag Signature Bag. RADLEY BATTERSEA BORDERS BLUE LEATHER HANDBAG TOTE SHOULDER BAG NEW!!! RADLEY JOHNSTON CORAL PINK LEATHER HANDBAG TOTE SHOULDER BAG NEW!!! RADLEY NORBURY MUSTARD YELLOW SAFFIANO LEATHER HANDBAG TOTE SHOULDER BAG NEW!!! RADLEY BEDFORD LEATHER PINK HANDBAG SHOULDER TOTE CROSS BODY MULTIWAY BAG NEW!!! RADLEY ELGIN AVENUE CORAL LEATHER HANDBAG SHOULDER CROSS BODY BAG RRP £189 NEW!